The Ryūkyū Islands (琉球諸島, Ryūkyū-shotō), also known as the Nansei Islands (南西諸島, Nansei-shotō, lit. "Southwest Islands"), are a chain of Japanese islands in a line between Kyushu and Taiwan. The native people of the Ryūkyū Islands are the Ryūkyūan people. 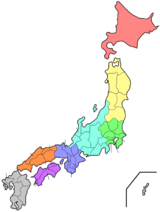 In the islands, the Ryūkyū Kingdom (琉球王国, Ryūkyū-ōkoku) dates from the middle 14th century. It entered into a tributary relationship with Imperial China. In the early 17th century, the kingdom entered into a tributary relationship with Japan, preserving as usual the independence of the kingdom and its rulers. In 1765, the islands were described by Hayashi Shihei in Sangoku Tsūran Zusetsu. The islands are at the eastern edge of the East China Sea and the western edge of the Pacific Ocean. The Islands are separated into two geographical regions: the Northern Ryūkyū Islands, centered on Amami Island, and the Southern Ryūkyū Islands, centered on Okinawa Island. Sometimes the Southern Ryūkyū Islands are further divided into the Okinawa Islands and the Sakishima Islands. The largest of the islands is Okinawa Island. Karate was invented by the local people (mainly from Okinawa). The Japanese phrase "Karate-do" means "way of the empty hand"). ↑ Klaproth, Julius. (1832). San kokf tsou ran to sets, ou Aperçu général des trois royaumes, p. 175 n1. ↑ 7.0 7.1 Matsumura, Wendy. (2007). Becoming Okinawan: Japanese Capitalism and Changing Representations of Okinawa, p. 38; excerpt, "March 27, 1879 marks the birth of Okinawa Prefecture and the death of the short-lived Ryukyu domain, which itself came into being on September 14, 1872, replacing the Ryukyu kingdom." This page was last changed on 27 March 2018, at 11:18.